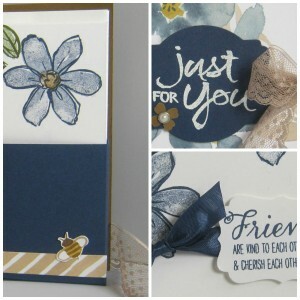 Just Julie B's Stampin' Space: English Garden Card Box! This beautiful card box is easy to assemble and sure to impress! You can easily change up the colors and papers it to suit anyone! This box will hold four decorated handmade cards and envelopes. What a great gift idea for birthdays, hostesses, and teacher gifts or even to sell at Craft Shows! Once you start making these card boxes, you’ll want to make them for everyone on your gift list! This fun set was made by Laurie Zoellmer and you can get her tutorial when you subscribe to the month of July over at Craft Project Central.